Will California Be Able To Keep Up With Marijuana ? The year started with a lot of excitement for the people of the Golden State. Everyone already knows the reason for the celebration. Proud consumers of recreational marijuana in the state trooped out on the first day of the year to visit marijuana dispensaries in their respective areas. Twenty years after it pioneered the legalization of marijuana for medical use, residents can now buy recreational weed in legalized stores across the state. “It feels good that we can now purchase marijuana for other purposes besides when it is being prescribed. Cannabis is a wonder plant and I can never stop talking about its many health benefits. It is wonderful to have a feeling of safety and security, and to have so many people here for the same reason I am. I am lucky I only met a few people on the queue. I wonder if this dispensary will have enough weed to cater to this huge demand,” says Jeff, a 60-year old resident of Oakland. Californians can pat one another on the back for their success at voting for legal recreational marijuana in 2016. But has the issue of marijuana being always available when users need it really been addressed? Before the start of 2018, cannabis was scarce and difficult to purchase because of the strict regulations that governed, even, its medical use. With approximately 15% of the total population of California (which is estimated at 4.63 million people in 2016) being smokers of marijuana, and only about 90 businesses securing licenses so far this year, how optimally will the infant marijuana business cope with the distribution and supply, as demand grows every day? There is the issue of uneven distribution of marijuana products across the state. Most dispensaries are concentrated within Palm Springs, San Francisco Bay Area, Santa Cruz, and San Diego. Some cities like San Francisco and Los Angeles will not have recreational pot available immediately. This is because marijuana producers had a hard time getting approval and licenses from the local authorities. Other cities like Fresno, Bakersfield and Riverside are among the districts that have adopted laws restricting recreational marijuana sales. The marijuana industry in the state needs a lot of expansion. Over two decades ago, California became the first state to legalize pot for medical use but acceptance of the new laws for recreational marijuana in the state has a few challenges. The state government has the obligation to grant licenses to local farmers and producers but they will need approval from local governments. Local governments, currently, are either banning cannabis farming or stalling the processes required for securing the license. 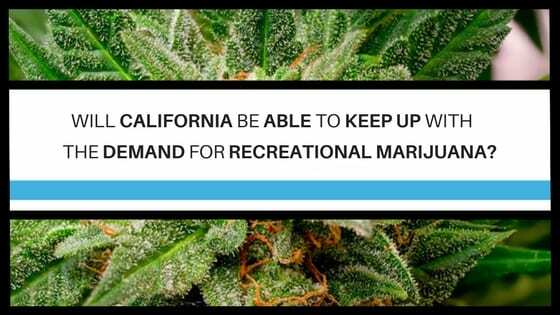 Experts report that the amount of marijuana being produced in California currently cannot meet the current demands of marijuana users in California. Marijuana dispensaries are selling from the stock they had last year, and what is in storage will not last much longer. With new marijuana businesses having a hard time being licensed, it will only be a matter of time before supplies run out. Dispensaries are already struggling to keep stock to keep some of the more common strains in stock for fear of running out of business. Will Senn, an owner of three marijuana dispensaries projected that the state failing to grant license to more producers in the next few months might cause serious problems as products may not be available anymore. While the state government claims to be aware of some the issues of increasing demand and limited legal producers, they are discouraging critics from pressing the “panic button” so quickly. The legal marijuana industry is still at its infant stage and there is plenty of time to adjust to new developments concerning the production of recreational marijuana. A report by ERA Economics which was prepared for the state government showed that in 2016, an estimated 13.5 million pounds of marijuana was produced in California alone, while about 80% of it was illegally shipped to other states. It could be safe to assume that out-of-town shipping for the substance will drastically reduce. Local governments are just taking time to evaluate the public-health and public-safety costs in the face of new cannabis laws. The government understands the potential impact of the marijuana industry to the economy, and in time, adjustments will be made and the situation will balance itself out. The group most affected would be the small scale farmers who are finding it hard to get a licensed by local governments, as a prerequisite to attaining legality status at the state level. If this will imply shortage of supply in the short run, I believe the system is going to find a way around it. This is not supposed to be bad news. It is an opportunity for the marijuana industry to properly erect a legal system of patronage from the onset, and to know the challenges it would constantly be faced with. It is an opportunity for the marijuana industry to properly erect a legal system of patronage.